A crutch alternative for patients who either cannot or choose not to use crutches. Perfect for patients who are recovering from either foot or ankle issues. The first unit with LOOP HAND BRAKES! Much easier than traditional "bicycle style" hand brakes and requires less coordination. Includes FREE vinyl pouch to store belongings. Ergonomically designed, lightweight aluminum frame that is silver in color to hide scratches. Easy folding mechanism makes transporting unit a breeze. 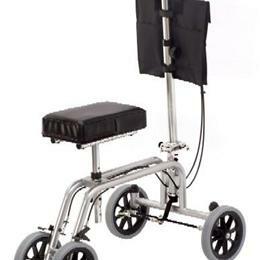 Adjustable tiller & knee pad to accommodate different user heights. User Weight Limit: 400 lbs. Weight of Unit: 22.5 lbs.